If you liked The Master and Margarita you might like these books. A literary sensation from its first publication, The Master and Margarita has become an astonishing publishing phenomenon in Russia and has been translated into more than twenty languages, and made into plays and films. 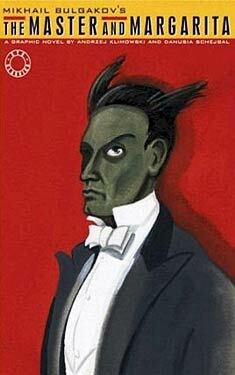 Mikhail Bulgakov's novel is now considered one of the seminal works of twentieth-century Russian literature. In this imaginative extravaganza the devil, disguised as a magician, descends upon Moscow in the 1930s with his riotous band, which includes a talking cat and an expert assassin. Together they succeed in comically befuddling a population which denies the devil's existence, even as it is confronted with the diabolic resuits of a magic act gone wrong. This visit to the capital of world atheism has several aims, one of which concerns the fate of the Master, a writer who has written a novel about Pontius Pilate, and is now in a mental hospital. Margarita, the despairing and daring heroine, becomes a witch in an effort to save the Master, and agrees to become the devil's hostess at his annual spring ball. By turns acidly satiric, fantastic, and ironically philosophical, this work constantly surprises and entertains, as the action switches back and forth between the Moscow of the 1930s and first-century Jerusalem. In a brilliant tour de force, Bulgakov provides a startlingly different version of Pontius Pilate's encounter with one Yeshua, a naive believer in the goodness of man. The interplay of these two narratives is part of the ingenious pleasure of this work which defies all genre classifications and expectations. The commentary and afterword provide new insight into the mysterious subtexts of the novel, and here, for the first time, The Master and Margarita is revealed in all its complexity. Originally written between 1928 and 1940, The Master and Margarita wasn't officially published in Russia until 1973 because of state censorship.